Hostel Qapaq Raymi is located in the commune of Caldera, Atacama Region. We are a new Backpackers and/or Bed and Breakfast, managed by the owners, oriented to all kinds of publics: families, friends, backpackers, etc. We are located in the center of Caldera, close to Plaza Carlos Condell, Tourist Office, Municipality, banks and ATMs, supermarkets, museums, restaurants, beaches, market, locomotion and 10 minutes from Bahia Inglesa. We are characterized by providing quality, friendly and welcoming attention based on respect for our guests, allowing them to enjoy and rest in a quiet and pleasant environment. Always ready to receive diverse national or foreign tourists so that they can discover a commune with history, traditions and with the best beaches of Chile. 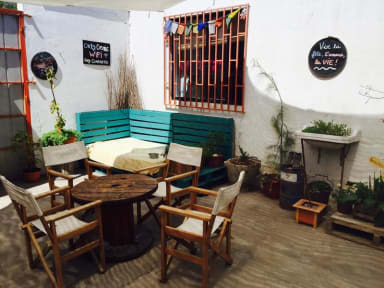 Located in the center of Caldera, close to: beaches, supermarkets, restaurants, natural products stores, cafes, fishermen's wharf, museums, bus to Bahía Inglesa, municipality and tourist information office, banks, ATMs, pharmacies and Plaza de Armas. The hostel has 5 rooms in total: two shared rooms with 5 beds, a shared room with 4 beds, a matrimonial room with double bed and bunk beds and a private room with 2 bunk beds. Each room is spacious and bright. We have lockers available for everyone in each room. For our friends we have parking for Motorcycles and Bicycles. Moreover, we realize tours in different places of the commune of Caldera and Region of Atacama: Tour of Beaches (Caldera to Playa La Virgen), Tour to National Park Pan de Azucar, Tour Flowers Desert, Tour Mine San Jose, etc. Das Qapaq Raymi ist ein neues Hostel - und eines der besten in dem ich je war. Alvaro und Manu haben mehr als ein Hostel in Caldera aufgebaut - es ist eher ein Zuhause. Ein Ort, an dem man sich einfach wohlfuehlt. Alles ist wunderschoen eingerichtet, mit Liebe zum Detail gestaltet. Die Kueche ist super, der nette Innenhof echt klasse. Aber das Beste ist das Team selbst - ein so herzliches, nettes und authentisch hilfsbereites Verhalten habe ich auf Reisen noch nie erlebt. Really nice and clean hostel with a nice flair. But really expensive and you have to pay extra $1.500 to.leave your staff for the day and extra $4.500 for staying in the public areas.